I caught the ‘Ngozi Okonjo-Iweala for World Bank Presidency’ bug late because, initially, I thought it was a passing fancy. In an interview with the Economist in March, she said, “I came because I believe in standing up for something and putting my money where my mouth is. Who is willing to come in and get their hands dirty? Who is going to fight this corruption?” And then in April, she was campaigning to be World Bank president. What’s this coming and going these several seasons like JP Clark’s Abiku? While some considered the temporality of her leaving which coincided with her announcement that Nigeria was broke and concluded that she was giving up the intractability of Nigeria’s problems for something ‘juicier’, others thought if she made it, it would translate to material benefits for Nigeria. The latter position is understandable but the first thing she would have done as World Bank president was to de-nationalise and de-racialise herself to be a world citizen. Though the odds were against her because, for one, out there, Nigeria is not of much consequence; it’s not enough to call oneself ‘giant’ amongst Lilliputian African countries. But by Sunday, the possibility became exciting. The last time I had such feeling was when Barack Obama contested the US Presidency. I read somewhere that the announcement would be 12 noon Washington time so I was on the watch almost all night. On Monday morning, the first news I saw was her saying “You know this thing is not really being decided on merit. It is voting with political weight and shares and therefore the United States will get it.” I felt completely let down. Her sense of entitlement sounded defeatist; the whine of a sore loser and typical Nigerian political-speak carried over to a global field. After working for 25 years with the World Bank, did Okonjo-Iweala just discovered the process was non-merit based? When the US media was fawning over her, some pejoratively anthropologising her poverty-ridden background, telling her story over and over as that of ‘a daughter of a tribal king’, why didn’t she criticise the process? Even the Nigerian media lapped up the ‘lost in Africa, made in America’ narratives made up to entertain a bigoted white gaze. Since she’s not a stranger to the selection process, why wait till the last minute to complain? She could have waited for the news, congratulate the winner and walk away with her head high, leaving spectators like us to whine about the US hegemony that ensures those who know how to dance always go home with the horsetail. We would also console ourselves that at least, the spirit of the Olympics is not in winning but in participating; that for someone who is three times disadvantaged – black, female and African — she had run a good race; that the process is as important as winning itself. She pre-empted all that with her lack of sportsmanship. Her congratulatory letter to the winner afterwards was anti-climactic; at best, an afterthought. And speaking of merit, who says Dr. Jim Yong Kim is less qualified? He has a very impressive CV and the World Bank presidency is one that doesn’t require certificates in Economics. 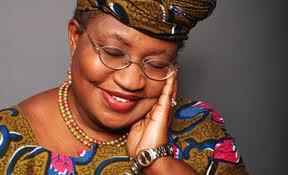 The Bank employs scores of economists and theorists, one of which was, ironically, Okonjo-Iweala herself. Like the American media that gave her all the good press grudgingly conceded, Kim has a strong record of developing programmes to fight diseases like HIV/AIDS and tuberculosis in poor countries. If he did so much to bring health care to the poor, why not him? Up till now, I have yet to see any of the pro-Okonjo-Iweala media say concrete things she has done for the poor, either in Nigeria or elsewhere. The much talked about debt relief she obtained for Nigeria in 2006 has, so far, not worked as she said it would. The same argument she sold at that time was similar to what she peddled during the January fuel subsidy debate. Some western media reported that “she led the Paris Club to negotiate debt relief” on behalf of her country (Note: in their effusiveness, they missed the irony). But even if there is ‘merit’ in the process like she would have it, why should the post go to a Nigerian? How much impact has Okonjo-Iweala’s magic made on the system that a global institution should hire her? If you are an economist in a country that outlined SURE in January, spent billions promoting it and in February, the President casually let it slip that it was withdrawn, why should the world take you seriously? What happened to some of the policies she was previously involved in such as NEEDS, SEEDS, Vision 20:2020? Couldn’t Nigeria’s consistent policy somersaults have affected her candidature? When in January the price of petrol escalated scandalously, was all she had to offer as safety nets not futuristic plans such as ‘good roads’ and ‘maternal medical care’? Would the paymasters at the World Bank not have been scandalised by this seemingly inhumane approach to economic policy if it were really a thing of merit? While I will not call this an outright lie, I am ashamed that rather than acknowledge that the January protests were critical in Nigerian history; people actively resisting government’s penchant for foisting harsh policies on their battered selves, Okonjo-Iweala reduced it to a few individuals who merely needed clarification about a policy and a photo-op. I noticed she eluded the part that people lost their lives in those protests. If it were in America, would it have been so easy to gloss over the lost lives? Are Nigerian lives that worthless she could not acknowledge because she wanted to be the World Bank president? If the process of selection was based on merit and they considered this aspect on Okonjo-Iweala, should that itself not disqualify her? This piece was originally published in The Punch. Things will never the same again ba? for your mind! Dr. Iweala got drafted into this race by those who know her worth and expertise. Her entry into this race has changed the dynamics of the election in the world bank. Things will never remain the same again. I rest my case too. It was fine when everyone said the whole 'merit' thing but pretty disappointing to have her whine about it. Ms Iweala has been MD in an institution without merit. She should be worried about it. THE ARTICLE HAS NOT SAID ANY REASONABLE THING. IT IS JUST ONE OF THOSE ARTICLES THAT ROLLS IN THE MIRE! NOTHING TO SAY BUT TO THROW STONE!